Plant Type: Deciduous Flowering shrub Family: Hydrangeaceae Native Range: Southeastern United States Height: 6 to 8 feet Spread: 6 to 8 feet Bloom Time: May - July Bloom Color: White changing to purplish pink Flower/Fruit: 4 to 12" erect panicles of creamy white fragrant flowers in summer; fades to pink, then tan; good for drying, seeds are eaten by birds Sun: Full Sun to Part Shade Water: Medium Maintenance: Low Fall Color: Bronze, Crimson or Purple Drought Tolerance: Medium Site Requirements/ Soil Tolerances: Sun to partial shade; prefers moist, well-drained soil but tolerates damp soil. Grows best in woodsy situations on limey soils. Add lime if your soil is acidic. Avoid full sun in hot climates. General Culture: Mulch root zone in summer and provide somewhat constant moisture. Winter protection (e.g., burlap wrap) is advisable in USDA Zone 5, particularly when the plant is not fully established. Little pruning is needed, but should be done any time after flowering. 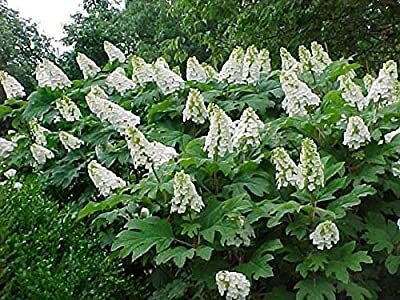 Uses: Mass or group in a mixed shrub border or naturalize in a native plant or open woodland garden. Also may be used for backgrounds, accents or specimens, foundation plantings or hedges. 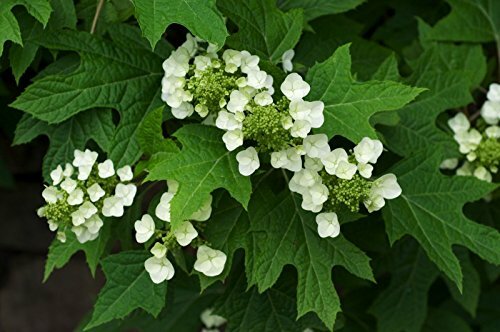 Sowing Oakleaf Hydrangea Seeds: The seeds of Oakleaf Hydrangea are extremely tiny. Wear your glasses and don't breathe while handling. Sow indoors. For best results, please follow the instructions in the order provided. Germination: Surface sow indoors under a grow light. Use a dome lid and mist regularly to keep moist. Requires light for germination. Artificial light is recommended. 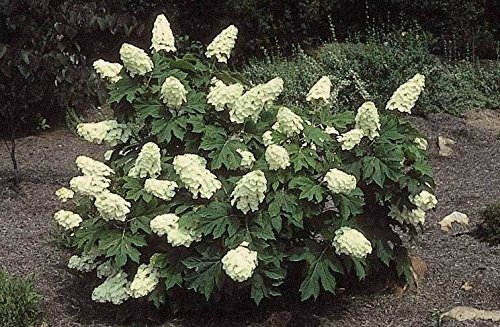 QTY: 50 SEEDS Common Name: Oakleaf Hydrangea Zone: 5 to 9 Growth Rate: Fast One of the most handsome plants for landscape designers, Oakleaf Hydrangea is an upright, deciduous shrub with a broad, rounded habit that typically grows 4 to 6 feet tall, spreading by stolons to form mound like colonies. Distinctive, deeply lobed, oak like, shiny deep green leaves to 8 inches long turn attractive shades of bronze, crimson or purple in autumn. Mature stems exfoliate to reveal a rich cinnamon brown inner bark which is attractive in winter. 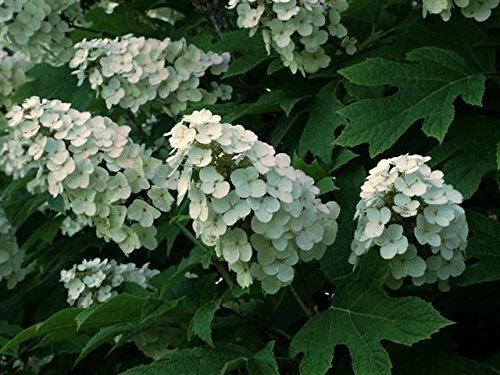 With a long spring to summer bloom period Oakleaf Hydrangea features elongated, 4 to 12 inch long conical clusters of white fragrant flowers which slowly turn pinkish purple with age. It likes moist acid organic laden well-drained soils in full sun or partial shade, the edge of woodlands is ideal.